Doug Preston and his son Collin are in the Class 4A finals for the third year in a row. They lost to Johnson Central in 2016 and beat the Golden Eagles last year. The Wildcats face Johnson Central in the title game this time around too. Doug Preston has arrived at a special place in his football coaching career. 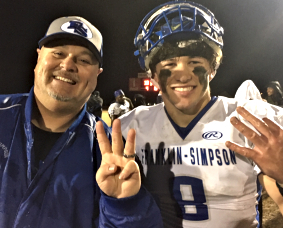 He’s at Franklin-Simpson, where he has guided the Wildcats to the state finals for the third year in a row, and his son Collin, a senior linebacker, has been along for the ride. What makes Doug Preston’s story even more interesting is the winding road he took to reach this destination. Over the last 27 years, he’s coached at 10 different high schools. The Bourbon County and EKU graduate has hopscotched across the Commonwealth, working the sidelines in Central Kentucky, Northeastern Kentucky, the Louisville area and now Western Kentucky. Preston’s first coaching gig, which he started while he was still in college, was at Harrison County under Ray Graham for three seasons. From there he went to Lincoln County and assisted Marty Jaggers for two years. “I still carry a lot of the offense and defense I learned from him,” Preston said. After that he went to work for Sam Harp at Danville, but he stayed only one season before taking the head coaching job at Paris, in his hometown. He wound up coaching the Greyhounds for just one season. His next stop was Garrard County, where he served on Jeff Hester’s staff for a few years before returning to Danville and helping Harp for a couple more seasons. Collin Preston and his sister Ashton. By then Preston said he got the “itch” to be a head coach again. This time he was ready for the challenges. He took over a floundering Rowan County program and in three years elevated it to respectability. Then it was on to Louisville Western, where Preston promptly led the Warriors to a school-record 10 wins. After a second year at Western, he moved on to Bullitt East and again had great success in his first season. He guided the Chargers and star running back Zack McCarthy to the Class 4A finals. They failed on a two-point conversion try in the closing seconds and lost to Bell County 15-13. He continued teaching at Bullitt East so his daughter could graduate there. He stayed connected to football that fall by helping Crad Jaggers at North Hardin. In 2012, he got what turned out to be an opportunity of a lifetime. He applied at Franklin-Simpson, where Tim Schlosser had stepped down as coach and become the school’s principal. Schlosser viewed Preston’s wanderlust as a positive. “He’s coached in just about every part of the state,” Schlosser said. “There’s a big difference in Rowan County and Louisville Western, and Bullitt East and Danville, and Paris and Franklin-Simpson. Drawing on all those experiences helped mold him as a football coach. Preston keeps in touch with his former mentors, especially Harp and Jaggers; and buddies Dudley Hilton (whose Bell County team beat Bullitt East in the 2008 finals) and Jerry Perry. Doug Preston and son Collin, shown during coaching days at Rowan County. She’s also thrilled to see her husband and son share in the pride of getting to the state finals again and again. After falling in the title game in 2016, Franklin-Simpson won the championship last year, and now has a chance to repeat. “With all the father-and-son combinations in the state, it’s a rare thing to get to the finals once, let alone three years in a row,” Jessica said. “And it was so special that both of them got to see their dream come true last year when they won it. A ride that has taken the Prestons all over Kentucky, from Cynthiana to Stanford to Danville to Paris to Lancaster to Danville again, to Morehead to Louisville to Mount Washington and now to Franklin. “My wife has been awfully supportive as I’ve chased my dreams,” Doug said. “I’m not sure I did it the right way, but somehow we’ve ended up here, where we’ve had a great run because we’ve had great players.